I love Modcloth, but it’s been a while since I’ve taken the time to really explore the site. Luckily, in my search for cute statement flats, I remembered it and went to have a look. I found a treasure trove of Really Very Fun footwear and also, a sale! Here’s a fair warning: Modcloth only carry a small stock of each item and when they run out they usually don’t restock unless enough people basically beg for it to return. These mega-cute shoes were all still available in a choice of sizes at the time of writing, but never assume! So what do we have here? I’m not adding individual pictures, because these are all pretty self explanatory. 1 Glow in the dark star shoes! 5 All Over Print Fox Head Trainers! 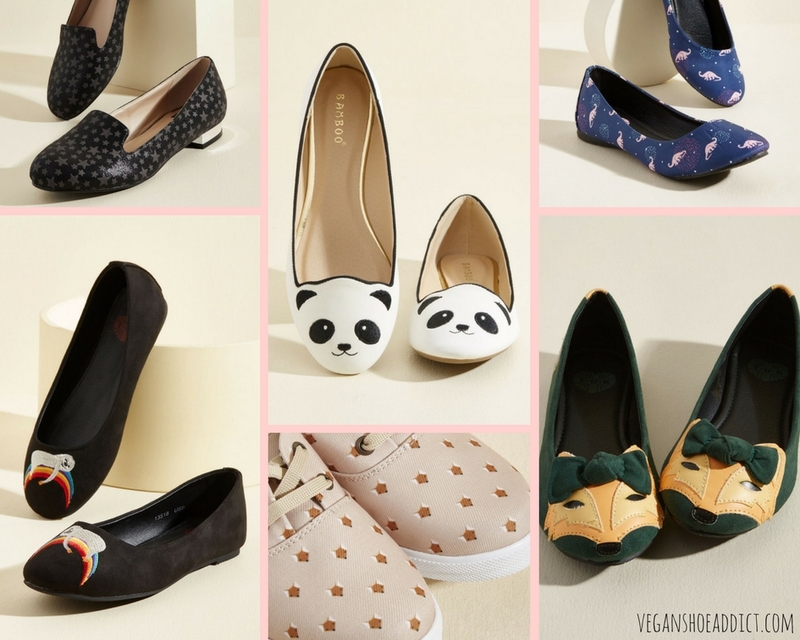 6 Cute Fox Head Flats! Glow in the dark star shoes! They look like simple black flats with dull grey stars, but wear them in the sun for a while and they’ll glow like…uhhh…the stars! If you click through below, you can see an image of them sort of glowing (it’s not a very dark picture, I guess cause otherwise you wouldn’t be able to see the shoes). Also, these will glow great under UV / black light, but are totally respectable under normal lighting conditions. You could almost wear them to work and no one would ever know you’re secretly a fluoro-raver! And hey, if you’re at work and there’s a power cut and you are exposed as the sort of person who wears glow in the dark shoes, your coworkers will actually thank you for leading them to safety and literally worship at your feet forever. Yeah. These can go as the image for the Wiki article about Kawaii. As an added bonus, evolution has made pandas fetchingly monochrome, so you can wear these with pretty much any outfit and they’ll blend right in, while being true to their animal kingdom originals. I dare you to look at these and not smile! Proud geek that I am, I may just like these best. They’re basically my nerdy childhood and my, umm, less nerdy adulthood rolled into one. Ballet flats are not nerdy, right? I mean, obviously I’d prefer these on some sort of crazy platform heels with some text saying how not nerdy I am, but these will do. Nerd chic, yo! It doesn’t get much better than a sloth sleeping on a rainbow. Sloths are cute, rainbows are cute. Everything is cute. That’s why they made these flats black, because anything else would have been impossibly awesome. Plus, black is the best colour and obviously makes everything better. I love you, sloth shoes! Here they are in their natural environment. All Over Print Fox Head Trainers! I’m happy to report that fox shoes are apparently in style. There seem to be a lot of foxy shoes around. These neat plimsole style trainers have tiny little fox heads all over them and are therefore wonderful in every way. They’re also running out fast, but they are so cool I’ve listed them here for the benefit of those of you who are the right size. These come in a lovely green shade and feature cute little fox heads and bows. The fox heads make them cute and the deep green shade makes them quite geek-chic. Also, foxes are smart, so you’re obviously going to look smarter by association while wearing them. Just sayin’.